As an electricity consumer you may not really know the importance of a circuit breaker, but I want to tell you a little about its roles and functions especially in Nigeria where electricity is not too stable. I have always wanted to work in the oil and gas sector because we all want good pay and a good life. During my schooling days, my lecturers made so much emphasis on this topic but I never circuit breakers were so interesting and at same time dangerous to work with. I am not going to give you those lengthy and bogus definitions you find on text books; rather I am going to be very practical. What does it mean to be practical? I am going to tell you what a circuit breaker is ideally. From my own experience, I can authoritatively tell you that a circuit breaker is an electro-mechanical device that is used to make (switch ON) or break (cut OFF) an electric circuit under normal or abnormal conditions. I am now going to tell you what switch OFF mean in the context of our discussion. We all in Nigeria are familiar with the way power failure is experienced. The electricity distribution operator may have received an order from the control office to switch off a particular feeder, he does that by switching off the breaker feeding that feeder or the breaker may have sensed a fault and tripped. Switch ON simply means restoration of power supply. This is done by the operator in charge of substation. The circuit breaker does not function with the amount of voltage it interrupts (maybe 330kv, 132kv, 33kv or 11kv). Most of the breakers used by the electricity distribution companies are coordinated by a tripping unit which consists of a 110v dc source, a relay, and the trip coil. The 110v dc actually coordinates the function of the relay. Now under a fault condition, the relay senses the fault and sends signal to the trip coil, the signal sent to the trip energizes the contacts of the trip coil to move from normal open to normally close thereby forcing the breaker to move from its closed position to open or trip on fault. Now we are going to discuss two of the most widely used breakers in Nigeria, The gas operated and vacuum breakers. The gas operated circuit breaker makes use of sf6 gas. The sf6 gas is an electro-negative gas that is used as the arc quenching medium during operation. 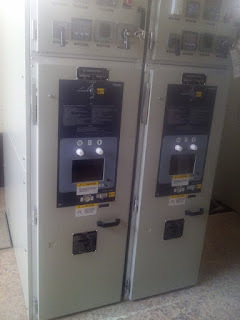 This is one of the most common breakers in the Nigerian power sector. The vacuum circuit breaker is the most common I have worked with as a substation operator. The arc quenching medium is the absence of air in the vacuum that houses the contacts. The essence of this whole write up is to tell you the distribution companies in Nigeria are working round the clock to improve distribution of power to its customers, but the major problem is inadequate load allocation from the National grid as Nigeria generates less than 4000MW of electricity.